'Brakes out of service' is defined as having one-fifth or more of a braking system out of order. Federal safety records obtained by NBC News show that the limousine involved in an upstate New York crash that killed 20 had been cited this year for numerous violations, including having "brakes out of service." 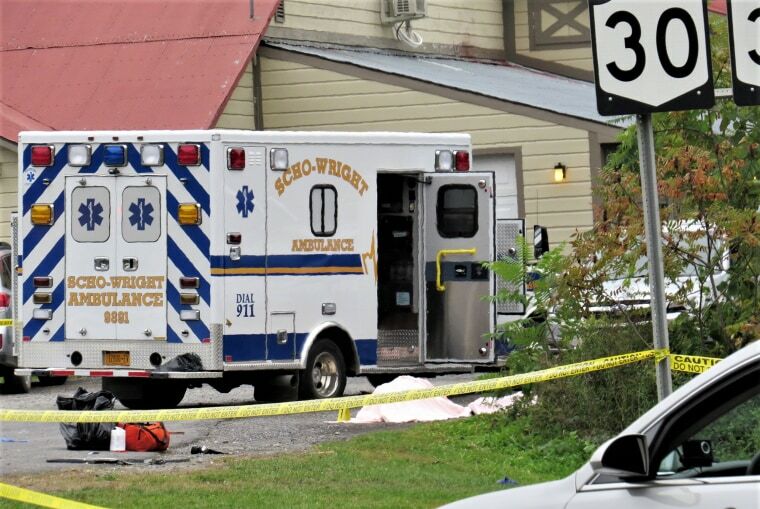 Saturday's crash in Schoharie was being investigated by the National Safety Transportation Board. All eighteen people inside the modified, "stretch" 2001 Ford Excursion — the 17 passengers were celebrating a surprise birthday party — died when it barreled down a hill and struck a parked SUV. Two pedestrians were killed when that vehicle hit them, authorities said. The limo was operated by Prestige Limousine of Gansevort, N.Y. The "brakes out of service" citation, issued after a March 21 inspection, indicated that 20 percent or more of the roughly 5-ton vehicle's stopping power was compromised. The records also indicate that brake lines were constricted or obstructed. This could apply to lines running to the rear brakes, which have to be extended when a constructor cuts a vehicle and then adds length to convert it into a limousine. Frank Figueroa, president of Pinnacle Limousine Manufacturing of City of Industry, Calif. — which did not work on the Prestige limo in Saturday's crash — said brake-line constriction would be rare because the lines, even extended ones, should be made of steel. "There's no way of compressing those," he said. Front brake lines, he said, are usually untouched in the process. He added that he believes the Excursion's 11,000-pound towing capacity means that its original braking system should be able to handle any extra weight a stretch job and extra passengers throw at the vehicle. The 'brakes out of service' citation was for a limousine with the same vehicle identification number as the one destroyed in Saturday's tragedy. That inspection report also listed "defective bus emergency exits" and violations for "inspection, repair and maintenance." Following a Sept. 4 inspection for a vehicle with the Excursion's license plate, "TOGALUX1," citations included malfunctioning anti-lock braking system warning lights, operating the SUV without making at least some of the corrections mandated by the previous inspection report, operating the limo without proof that it's had proper inspection, having out-of-compliance state registration or plates, and operating a vehicle in excess of a manufacturer's designed seating capacity. Limo constructor Figueroa said firms that use vehicles as old as the 2001 Excursion are considered to be "third-tier guys" in smaller cities. Prestige also had at least one other vehicle with inspection red flags, including brake system concerns and worn tires, federal records show. They indicate 22 violations this year for the company's 3-vehicle fleet. NBC News reached out to an attorney for Prestige but did not receive an immediate response. Prestige said in statements issued through its attorney that it has been diligent in making repairs and fixing defects and that it would cooperate with investigators while its fleet has been voluntarily mothballed. "Prestige Limousine extends its deepest condolences to the family members and friends of those who tragically lost their lives on Saturday," its latest statement reads. On Sunday authorities said driver Scott T. Lisinicchia, 53, did not have the specific commercial driver's license required to drive that limousine. The late driver's family said in a statement Tuesday that it believes that "unbeknownst to him he was provided with a vehicle that was neither roadworthy nor safe for any of its occupants." Responding to that, Lee Kindlon, an attorney for Prestige, told WNBC, "The driver was a longtime employee and friend. Our focus right now is offering condolences to the victims. We're waiting for the investigation and process to take hold."